Prior to VSE 2017 field phase: Algorithm development using dual-Doppler data collected with Doppler on Wheels (DOW) radars and dense network of in situ surface instruments during VORTEX-2, including terrain in the lower BC. Illustration of the dual-Doppler radar and in situ data used for the initial modification of wind retrieval software. Near-surface dual-Doppler-retrieved horizontal winds (vectors) and radar reflectivity (shaded) for three analyses of two supercells observed with DOW radars during VORTEX2; left: the rear flank of the Goshen CO., WY, storm, middle: a portion of the Goshen storm’s forward flank, and, right: the La Junta, CO, storm. Locations of near-surface gust fronts are traced (black lines) and positions of near-surface in situ wind observations are shown in blue (time-space converted, valid within 3 min of the dual-Doppler analysis time). Difference between dual-Doppler horizontal (vectors) and vertical (shaded) velocity retrievals when solutions include and exclude objectively analyzed surface wind observations. For reference, thick black lines indicate positions of near-surface gust fronts and black dots indicate positions of raw surface observations used in each retrieval. Vertical velocity at z = 0 m with the inclusion of terrain in the dual-Doppler retrievals in the Goshen Co., WY, case. 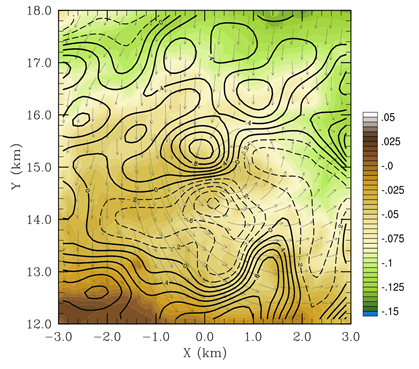 Color contours indicate terrain height in km relative to the altitude of the lowest radar; solid (dashed) lines are upward (downward) vertical velocities in m/s; vectors depict the horizontal winds.